Architect Ole Scheeren has designed a skyscraper for Kuala Lumpur that will have a four-storey-high tropical garden slicing through its middle. 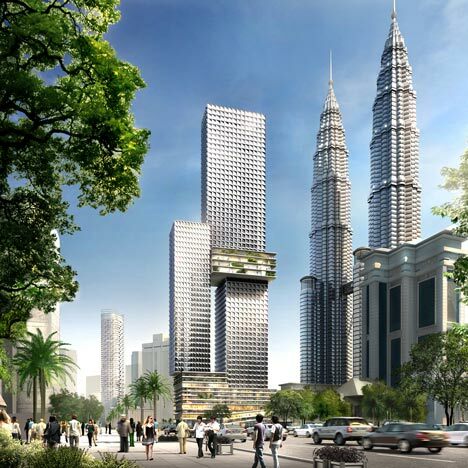 The Angkasa Raya tower will be 268 metres high and is to be situated alongside the Petronas Twin Towers, which were the tallest buildings in the world between 1998 and 2004. A restaurant, bar and infinity swimming pool will be nestled amongst the garden floors, while 280 apartments will occupy the storeys above. The lower levels of the building will house shops, cafes, car parks and prayer rooms. A luxury hotel will be located inside a smaller adjoining block. Construction is due to begin at the start of 2012. Ole Scheeren was formerly a partner at OMA, where he led the design of the China Central Television Station in Beijing, but left in 2010 to start his own firm – see our earlier Dezeen Wire. The tower façades are clad with modular aluminum sun-shading, geometrically optimized and carefully oriented to reduce solar heat gain under the intense tropical sun, and contribute to substantial energy savings through passive means. Other environmental features include a naturally ventilated atrium within the Residences Tower, eliminating the need for air conditioning and recirculation. By connecting the atrium through a series of large- scale voids to the building envelope, natural daylight is provided throughout the vertical space while communal seating areas and tropical lounges are created within the atrium. Rainwater harvesting, landscape re-irrigation, insulated green roofs, and the natural shading effects of the horizontal slabs of the Ground and Sky Levels effectively reduce the energy and water consumption and optimize the carbon footprint of the building.